Hearing healthcare is changing, but EarQ members are ready to face any challenge ahead. A recent training with Oticon focused on the programs and strategies that will keep independent practices ahead. I was a provider just like you and I realized that we needed a way to stand up and be heard. To combat the outside forces and the status quo. To organize our collective influence so we would never have to compromise the standards of hearing healthcare. From March 21-23, EarQ and Oticon hosted the biggest manufacturer-centric, network-based member event for EarQ members in New Orleans, Louisiana. 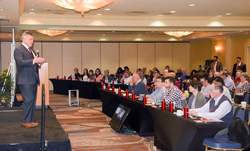 This three-day experience included training on Oticon’s technology and the strategies that are connecting EarQ members—independent practice owners—with more patients in their communities. As EarQ’s longest standing technology partner, Oticon backs EarQ’s mission to support the independent practice. At the event in New Orleans, experts from Oticon shared how the award-winning Opn™ hearing aid is opening up a new world of sound for patients by attacking the noise problem in a different way than hearing aids of the past. As over-the-counter and internet hearing aid sales rise, EarQ believes it’s more important than ever that practice owners create more pathways for potential patients. Iris, EarQ’s proprietary digital strategy helps members accomplish this by making their practice stand out online. At the event, EarQ discussed how these strategies and more are designed to keep the independent practice ahead. Ed Keller, president of EarQ, also shared how EarQ began its mission in 2001. EarQ will be hosting more member events throughout the year. For more information on these events or EarQ’s services, please call 866-432-7500. Since 1946, Oticon has been a manufacturer of hearing aids. This Danish-American company is currently one of the largest companies in the industry and a consistent leader in the science and technology of hearing worldwide.